This entry was posted on Tuesday, January 15th, 2013 at 8:58 amand is filed under . You can follow any responses to this entry through the RSS 2.0 feed. You can leave a response, or trackback from your own site. the truth of poetry and where it comes from, gorgeously told. i love that smiling owl, he all knowing too wise. keeping his secrets. what a wonderful capture of a process i think we all can relate to in one or the other way..love the images you use.. I could see this as I read it, so I say this is a great poem. Loved it. Kelly, this is a wonderful ! Beautiful! ” into a ransom note of bittersweet cacophony ” among others. A lovely write. ransom note of bittersweet cacophony… I especially like that. As always, beautiful writing. I loved this–especially the opening lines–beautifully done! fighting hard…to fly…oh this is beautiful, rich, and deep. You followed the universal bird theme well. Owls have always scared me for some reason, so I was glad to see one smiling in this one 🙂 Great write. Beautiful from title to closure. What more can I say? you fly” absolutely brilliant ending! 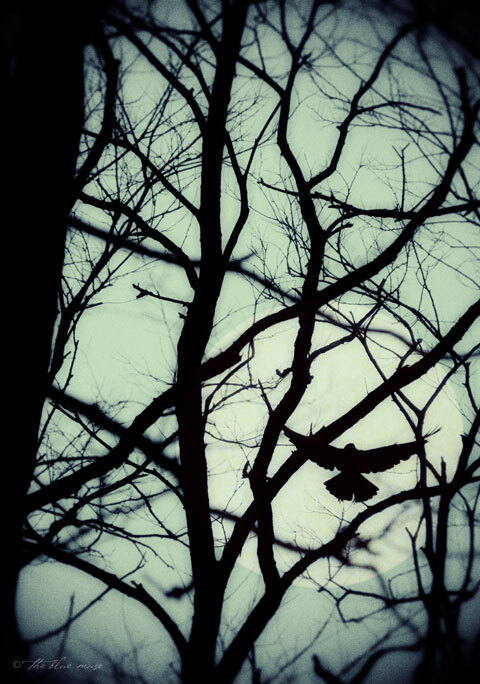 Great crow poem–seeing under the wing and feather to the magpie heart. I love it–and you know they’re a favorite subject of my own–not to mention a presence I always like to see in the worlds around us and within us. Especially like the song-like quality of the ending lines. the owl in the pines has me smiling, too. this is wonderfully phrased, catching the crow in a shining moment. … you mourn, you caw, you fly… this strong ending phrase gives the reader both a sense of powerlessness and assent to the fates. The third and last stanzas were my favorites in this. Amazing imagery here. This is so beautiful. Love your words, love the moon and your poem grasps whatever in me responds to beauty. I feel like the title alone could be a poem, every inch of this poem is dripping in poetic delight. ah, this was fun to read outloud, had a classic feel with some unexpected images. very fun to read, enjoyed very much. A very pretty poem – in a way kind of the opposite of personification, as the speaker/poet becomes very crow-like. And funny that roosters crow (in the morning.) Lots of beautiful lines and phrases here. The branch to broken is lovely. k.
so beautiful…the words and the photo. The beauty of this left me awestruck. This is gorgeous! I see silver and ebony…beautiful write! the image is the icing on top of a delicious helping of poetry! So interesting…how you make distinct pictures that capture the how process of poetry evolves. Great job. Loved it. Your metaphor is spot on and so painflly understood. Gorgeously sad. Wow, Kelly you just keep getting better and better. What they all said and a heartfelt: wow! Now THAT is some happenin’ poetry!! At first I took it to mean me, human has no song the moon has not written. And perhaps this can be seen that way. That’s the thing about wonderful poetry, we make it about us with words shared around these blogging firelights. I love the cached out long deal oak bit. And of course the black ribbon melody of midnight is a super poem in itself. I think I’ll go now and Google “habits of the crow.” who knows where the search might take me? definitely where the moon is shining. Well, that was interesting. I read on Wikipedia they do prefer oaks for nesting, then conifers. And crows are monogamous! I love how YOU write on nature so much, the best poetic stuff’s in there.